Learn the benefits of avocado and how great they are for your health! At last the benefits of avocado nutrition have finally been made public. Now everyone seeks to hear more about avocado nutritional benefits. A lot of smoothie lovers were already blending avocados regularly. The combination of smoothies and avocados are simply off the charts! I have been trying to get my family to eat avocados for a long time, but until it was combined with smoothies, it was an uphill battle. I would have to hide it as a spread. The avocado’s benefits alone are incredibly startling. Did you know that avocados are a fruit? Actually they are in the berry family, which I did not know before I began investigating them. People who eat a lot of avocados have shown to the medical community that the avocado can substantially lower blood serum cholesterol levels. After only a seven-day diet with avocados, those tested showed a remarkable 17% decrease in their cholesterol. Not only that, but as they greatly lowered their levels of bad cholesterol they actually raised their levels of good cholesterol! Nutritionally, avocados have been shown that the majority of the calories in them come from fat, it is monounsaturated fat. Do you or your family need potassium? Avocados are richer in potassium than the banana! Actually 60% higher! Avocados also are rich in protein and vitamin K, vitamin E, vitamin C, and Vitamin B. Please take note that C and E vitamins are antioxidants. Avocados also have calcium, iron, copper and magnesium and other trace elements. Not only that, but they have the highest amount of fiber content than any other fruit. All of these facts point to incredible benefits of avocado in your family’s diet and also point to the tremendous avocado nutrition that you can so easily give your family if you care to keep your family as healthy as can be. I’ve always said that having a nutrient dense diet was the key to vibrant health, and the avocado is definitely a nutritionally dense fat! Buying an avocado is pretty simple. If you live in either California or Florida, they are quite low in price there, especially the Florida variety. If you don’t live in those areas, you still have good choices. We just pay more. Avocados should yield slightly to hand pressure, if they are ripe. However, since everyone does this, you may get bruised fruit. If ripe ones are not available or you desire unbruised fruit, the old trick of putting fruit in a paper bag to have it ripen quickly also works on avocados. By the way, Hass avocados have bumpy skins, and their coloring goes from green to black. The darker the skin is, the riper the fruit. Some avocado growers say that you should buy an avocado that has retained its stem to avoid purchasing an overripe one. Smoothies are one of the best ways to get the benefits from avocados! You can easily blend 1/4 to 1/2 of an avocado into fruit smoothies and not even know that you are getting that beneficial fat and nutrients. It’s that simple! After you cut into an avocado you must either use all of it or store the leftovers properly in the fridge. One way to store avocados is to wrap it tightly in plastic wrap. 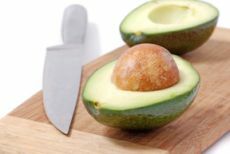 Another way is to rub it with fresh lemon juice; which can retard the natural browning that avocados suffer when exposed to air. Again, you should look into serving avocado for it’s avocado nutritional benefits so that your loved ones live a long healthy life. All of us can use the immense benefits of avocado nutrition for healthier lives that enable us to enjoy our golden years.